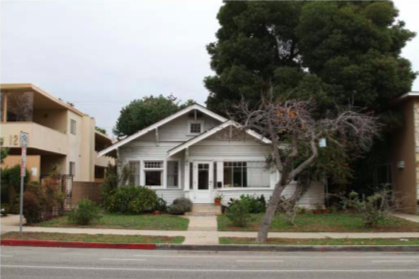 Santa Monica is preserving bungalows along 11th Street, most of which are over a hundred years old. SANTA MONICA—Santa Monica established an 11th Street Historic District that will protect five unique California style bungalows. Along 11th Street in Santa Monica, a small group of hundred year old bungalows has been home to a number of individuals and their families over the years. The proposed 11th Street Historic District Designation application was filled by the Santa Monica Mid-City Neighbors, a city-recognized organization, on June 7, 2018. The entire 11th Street block was built in a relatively short time span from 1904 to 1911, with the last home built was located at 1115 Arizona Avenue in 1925. 1. It exemplifies, symbolizes, or manifests elements of the cultural, social, economic, political or architectural history of the City. 2. It has aesthetic or artistic interest or value, or other noteworthy interest or value. 3. It is identified with historic personages or with important events in local, state or national history. 4. It embodies distinguishing architectural characteristics valuable to a study of a period, style, method of construction, or the use of indigenous materials or craftsmanship, or is a unique or rare example of an architectural design, detail or historical type valuable to such a study. 5. It is a significant or a representative example of the work or product of a notable builder, designer or architect. 6. It has a unique location, a singular physical characteristic, or is an established and familiar visual feature of a neighborhood, community or the City.